The SG-7040 Series simulates power supply voltage fluctuation to test automotive electronics. Connections of automotive electronics are not limited to +B, but connections are also done to ACC and IG. 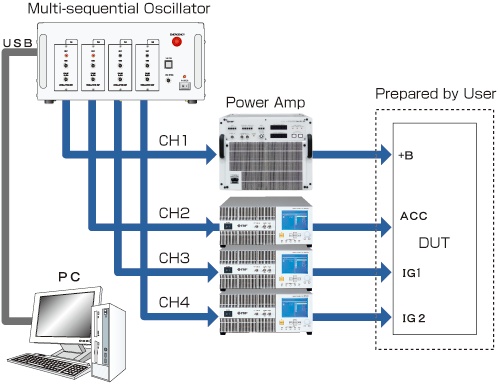 In response to testing needs for synchronized, multi-channel fluctuation simulations, the SG-7040 Series can be configured with one to four sequential oscillators and with the relevant number of high speed bipolar power amplifiers to carry out highly accurate and fast response tests on multi-channel basis. A waveform operation circuit is included for each oscillation channel making possible high resolution, highly accurate waveform output. Software control (USB) allows for simple and faithful reproduction of various events (complex, extended duration) of DC fluctuation output waveforms. Performs voltage fluctuation simulations on a maximum of four channels (variations in synchronization guaranteed at or less than 1μs). Fully automated testing with the goal of reducing test man-hours. The SG-7040 system is primarily comprised of the following three components: multi-sequential oscillator, bipolar power amplifier and arbitrary waveform creation software. The required number of channels of multi-sequential oscillator shall be configured according to test requirements and appropriate bipolar power amplifiers shall be selected according to the current requirement for each line of the device under test. The arbitrary waveform creation software easily creates complicated waveforms with repeated voltage and time ramping with its superb GUI. High-speed bipolar power source is selected according to the DUT power rating. © 2019 益安信科技股份有限公司 All rights reserved.